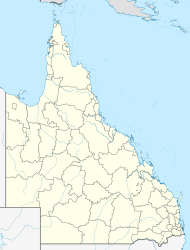 Wondai /ˈwɒndaɪ/ is a town and locality in the South Burnett Region of Queensland, Australia. The town is located to the south of the Bunya Highway, 241 kilometres (150 mi) north west of the state capital, Brisbane. In the 2011 census, Wondai had a population of 2,127 people. The name Wondai is believed to be an aboriginal word from the Waka language derived from either watya meaning dingo (a native dog) or wandar meaning nape of the neck. Wondai was also home to the legendary pacer Wondai's Mate. At the 2006 census, Wondai had a population of 1,402. The South Burnett Regional Council operates a library in Wondai. The Wondai library building opened in 1962 and is located at 78 Mackenzie Street. The Wondai branch of the Queensland Country Women's Association meets at 86 McKenzie Street. Australian Test cricketers Carl Rackemann and Nathan Hauritz. ^ a b Australian Bureau of Statistics (31 October 2012). "Wondai". 2011 Census QuickStats. Retrieved 1 September 2015. ^ "Wondai (town) (entry 37889)". Queensland Place Names. Queensland Government. Retrieved 2 September 2015. ^ a b "Wondai (locality) (entry 46282)". Queensland Place Names. Queensland Government. Retrieved 2 September 2015. ^ "24 HOURS OF SADNESS HITS THE SOUTH BURNETT". Just Racing. Phil Purser. 2004. Retrieved 1 March 2007. ^ Australian Bureau of Statistics (25 October 2007). "Wondai (Urban Centre/Locality)". 2006 Census QuickStats. Retrieved 28 October 2007. ^ "Locate a Library - South Burnett Regional Council". South Burnett Regional Council. Retrieved 26 February 2016. ^ "Queensland Public Libraries Statistical Bulletin 2016-2017" (PDF). Public Libraries Connect. State Library of Queensland. November 2017. Retrieved 24 January 2018. ^ "Wondai Library". Public Libraries Connect. State Library of Queensland. 15 August 2017. Retrieved 24 January 2018. ^ "Boondooma Homestead (entry 600967)". Queensland Heritage Register. Queensland Heritage Council. Retrieved 12 July 2013. This page was last edited on 28 December 2018, at 00:03 (UTC).